Hey y’all, today we’re going to talk about fabric drape and how it affects a garment. 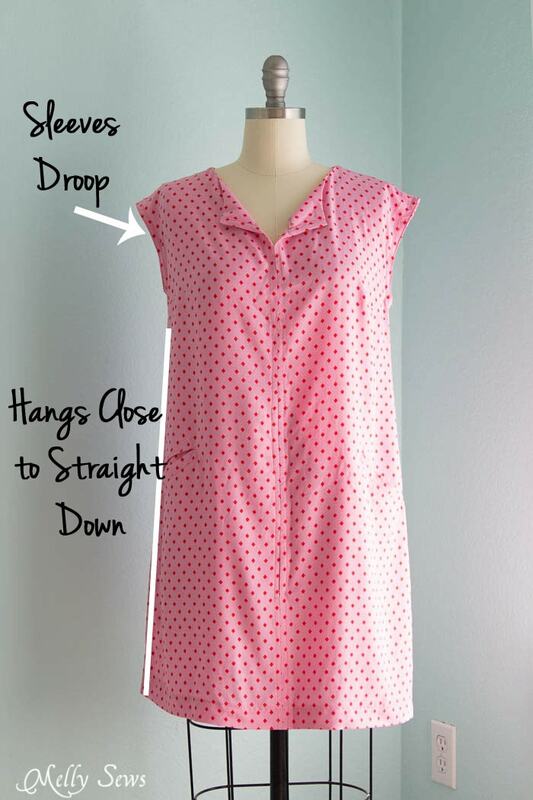 My newest pattern is going to call for a drapey fabric like rayon, and I realized that exactly what drape is and how it affects the outcome of a sewing project is a subject that might need clarification. So I thought a good way to demonstrate would be with the same pattern in the same size sewn in different fabrics. That way you can compare and see the difference. Technically speaking, fabric drape is the way fabric hangs in three dimensions. Does it retain the shape from when it is laid flat, or does that shape change? The way the shape changes has to do with drape. 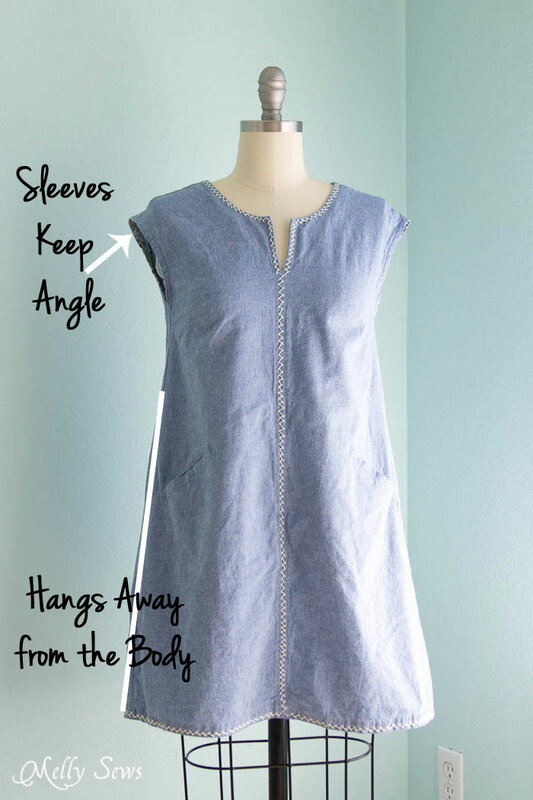 Let’s start with a Leralynn Dress in cotton chambray, above. This is a plain weave fabric (meaning the weave is made up of vertical warp threads woven over and under by horizontal weft threads) with similar weight and behavior to quilting cottons, which are also tight woven cotton. As you can see, this fabric does not have much drape. The fabric goes out in an A-line from the body, retaining most of the shape it has while laying flat. The shoulders retain the angle of the shoulder, even though this pattern extends the shoulder beyond the body. Compare that to the rayon challis Leralynn Dress below. Same pattern, same size, also a tight, plain weave fabric, but as you can see, rayon is more supple than the cotton chambray, which results in more drape. The sleeves droop, resulting in an elongated armhole. The uninterfaced neckline falls out. The dress hangs in almost a straight line down the body. Silk charmeuse, silky polyester blends, and silk crepe behave in a very similar manner. And the rayon challis can be contrasted with the cotton gauze below, which is a looser plain weave that crinkles from tighter weft weaving that warp strands. This fabric droops and hugs the body as it does, making it the most drapey. 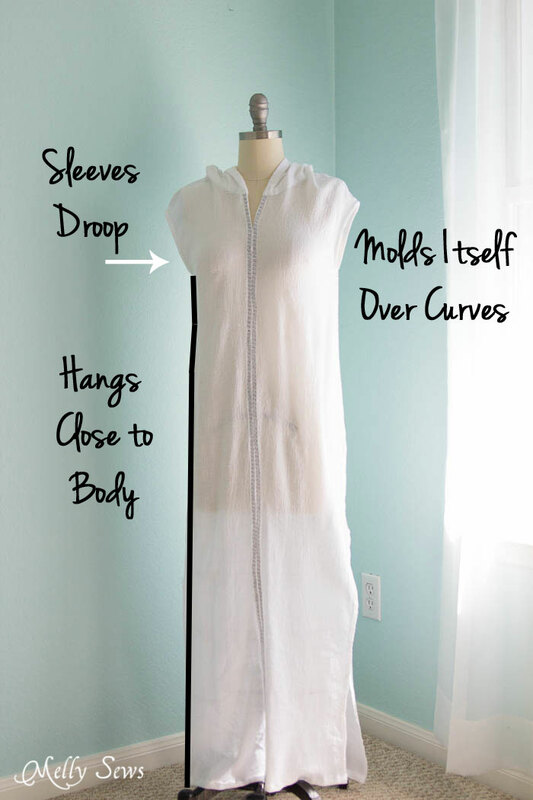 The armholes elongate, and the fabric molds itself over the body curves instead of hanging straight because this fabric barely supports itself. The loose weave of cotton gauze is also what can tend to make it “grow” over wear for a day. Seen side by side, the differences in drape are very clear between these three dresses. Now drape (or lack of) is not a good or bad thing except as it applies to the design. If you are looking for structure in a garment, cotton gauze and similar loose weave fabrics are not the way to go. Similarly, if you want something that shows off the body by skimming its curves, quilting cottons are probably not your best choice. Selecting the right fabric for the look you want to achieve is the most important step to a final garment you’ll be happy with. Great visual – thank you!! Wow, thank you for showing the same pattern! I’ve never really been able to tell the difference because the patterns showing off the different materials is completely different. I learn so much from you! Terrific post! I have sewn for many years, mostly quilting and small items, but am preparing myself to reenter garment making. This information about drape is so helpful. Thanks! Great feature! It is effective comparing differences side-by-side using the exact same pattern. Where would a woven (such as is in your first model) sewn on the bias fit in the scheme of things. Would this be a good way to have a woven drape a bit better? 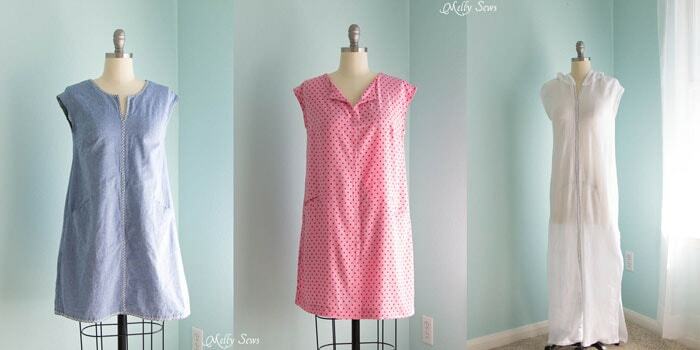 All of these fabrics will perform similarly on the bias as they do on the straight grain. Meaning, a woven with a lot of body (like the chambray) might drape a tiny bit more than it is here, but it will not hug the body by any stretch. On the other hand, the rayon would tend to hang even closer to the body than it already does. 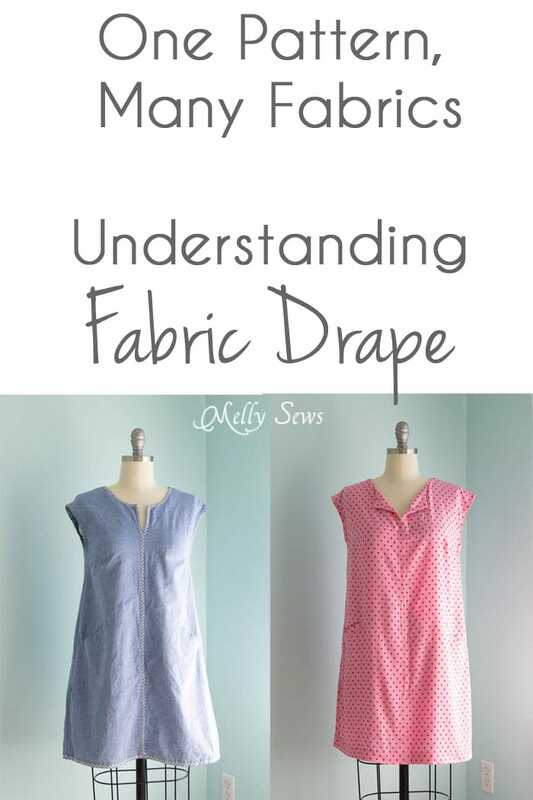 Definitely beneficial to see a comparison using the same pattern showing the differences of drape using various fabrics. As a beginner sewer it’s definitely helped me, thank you.